A response to the report of the High-Level Panel of Eminent Persons on the Post-2015 Development Agenda. Developed in collaboration with the Consultative Group on Early Childhood Care and Development and many of its partners, and introduced by Sheldon Shaeffer. 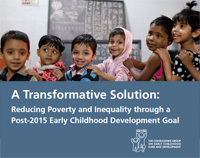 The global early childhood community proposes a Global Goal and Call to Action to reduce by half the number of children under age five who fail to reach their developmental potential. Current and future global development goals will only be met with increased and urgent attention to the overall development of young children. Over 200 million children under 5 years of age in low-income and middle-income countries – and increasing numbers in OECD countries and emerging economies – will not reach their full developmental potential because they grow up facing a broad range of risk factors, most notably poverty; poor health including HIV/AIDS and malnutrition; high levels of family and environmental stress and exposure to violence, abuse, neglect, exploitation; and inadequate levels of care and learning opportunities. This includes risks that result from emergencies related to conflict, climate change, and global demographic shifts through migration and urbanisation. A growing body of scientific research clearly indicates that these risks and adverse experiences, particularly in the first five years of life, have a profound negative impact on a child’s future well-being, especially in regard to health, education, and academic outcomes and earning potential. While progress has been made, most governments still do not prioritise early childhood in their health, education, poverty reduction, or other national plans, and many countries still lack early childhood development policies, strategic plans, and laws.Research also clearly demonstrates that the impact of these risk factors and adverse experiences can be mitigated by strengthening the environments in which young children grow and thrive through evidence-based strategies including: parenting interventions; early detection and intervention for developmental delays and disabilities; early childhood programs of care, support and learning, where possible integrated into home visiting programs; targeted health, nutrition, sanitation and social protection services; and good quality preschools. A measurable and actionable Early Childhood Development (ECD) goal will not only strengthen efforts towards the survival, health, development, and well-being of young children but also work to reduce the inter-generational transmission of poverty and inequality. Such a goal is a key to a human development and rights-based framework that promotes equitable and sustainable development and is implemented in partnership with multiple sectors and multiple partners. Reducing the loss of developmental potential in early childhood requires action in economics, education, health, nutrition, and social protection, properly placing the focus on the people at the heart of the development agenda rather than on the sectors themselves.Compelling progress made over the last two decades in neuro-developmental and brain sciences clearly establishes the fact that the period from conception to age five is the most critical to lifespan development because the brain is most “plastic,” or most open to experience. Inadequate nutrition, insufficient cognitive stimulation, and exposure to toxic stress do more damage early in life. Interventions have more impact and are more cost-effective in early childhood. While the report includes goals and targets that reduce risks to young children including addressing stunting from malnutrition and early education, there is no direct reference to the importance of early childhood development and the need to support permanent and responsive family care. Reducing by half the number of children under age five who fail to reach their developmental potential targets not only children but also their parents. Caregiver well-being has implications for childhood health outcomes. Moreover, caregivers are responsible for children’s access to health care; proper nutrition; cognitive, social, and emotional stimulation; and protection from violence and trauma. There is no country in the world, from high to low HDI, in which all young children reach their developmental potential. Although this goal is especially salient for low- and middle-income countries, it is equally relevant for low- income communities and families in high- income countries. The world’s post-2015 development efforts will have the greatest impact on the world’s youngest children and those yet unborn. For many, the current global dialogue will largely determine the quality of their lives. Yet these children remain voiceless in the current debates. As advocates for children and for sustainable human development broadly, now is the time to unite across sectors to demand—and deliver—justice and rights from the start. 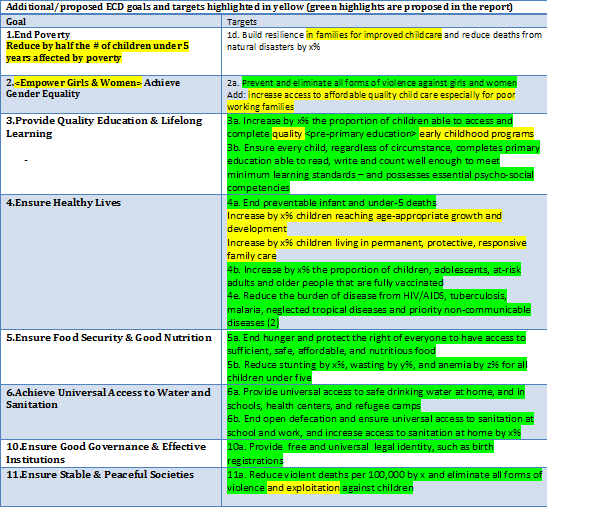 Are there additional arguments and strategies that should be used to enhance the role of early childhood development in the post-2015 development agenda? Please leave your feedback and suggestions below using the comments feature.